The performer pushes a colored silk into his closed left hand. When he opens his hand the silk is seen to have turned into an egg! Offering to "explain" the trick, the magician shows that the egg is hollow with a hole at one end. He pulls the silk out and displays the hollow egg. 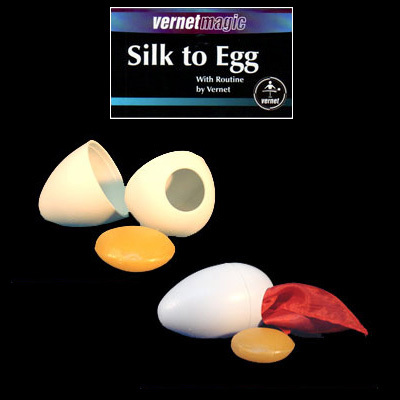 Again, he pushes the silk into the egg and shows how to cover the hole with his thumb. Then, he explains that someone might wish to question the egg, and in that case all you must do is break the egg on the rim of a glass and pour out the yolk and the white, which the magician does!